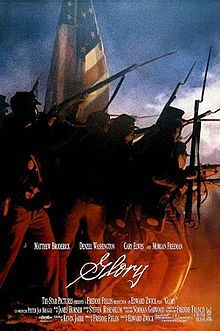 The premise of Glory is loosely based on the true story of the 54th Massachusetts Volunteer Infantry led by Colonel Robert Gould Shaw, the bold military leader of the U.S. Army's first African American soldier regiment. The inspiration for the film came from screenwriter Kevin Jarre; after him viewing a war monument depicting a memorial to Shaw and the 54th regiment consisting of Black soldiers. Jarre's screenplay was based on Colonel Shaw's letters and on two books, Lincoln Kirstein's Lay This Laurel and Peter Burchard's One Gallant Rush. Colonel Shaw came from a wealthy and socially prominent Boston abolitionist family. Earlier before the wartime events, his parents had even joined an American Anti-Slavery Society. As depicted in the film, the men of the 54th infantry trained near Boston, under the constant scrutiny of white soldiers, many of whom believed black soldiers lacked the stomach for combat. Yet the negative perceptions seemed only to inspire a sense of unity and pride within the regiment. The assault on Fort Wagner proved to be a turning point for black soldiers, serving to dismiss any lingering skepticism among whites about the combat readiness of African Americans, opening a new chapter in racial equality [courtesy of Wikipedia]. Near the end of the movie, when this black regiment of soldiers is preparing to attack Fort Wagner, we see Colonel Shaw give a rousing, inspiring speech to his men. Then, he dismounts his horse, gets in front of his men, raises his bayonet, and leads the charge against the fort. Surely, Shaw knew the attack on the fort was a suicide mission and that he and most of his men would die. Shaw's actions were not typical battlefield leadership. The modus operandi was for the commanding officers to lead from the back lines, directing their soldiers were to go and what to do. Shaw knew that he needed to do something radical, something different. He did this not only to earn the respect of the men that he led, but also to change the opinion of the white soldiers who did not respect their fellow black soldiers in the Union Army. Shaw's leadership from the front worked exactly as he had hoped and planned. This movie was a wonderful reminder for me of the importance of strong leadership, especially leaders who lead from the front. People need leaders who lead by example. Let me give you a personal example of what I'm talking about. When I'm not leading stewardship development issues at my church, my primary role is the orchestra director in our worship ministry. I have the awesome privilege of leading about 35 members of the most dedicated, consistent people I have ever known. Were they that dedicated when I first came on staff at my church over 12 years ago? Probably not, but through a process of asking for their dedication and faithfulness, combined with a model of dedication and faithfulness from me, they have followed my leadership from the front lines. One, I always come prepared to lead them in rehearsals in worship services. If I'm asking them to practice their music outside of rehearsals and to come prepared to play their very best, then I have to do what I'm asking them to do. I have to lead from the front. If I came into rehearsals or services missing cues and fumbling around trying to figure out what was going on, do you think they would be inspired to practice their instruments and music at home? I doubt it very seriously. Two, I make it a point to miss as few Wednesday night rehearsals and Sunday morning services as possible. At the very most, I miss 4-5 max, and my average is more like 3 per year. If I missed more than this, and I was constantly running in and out of town, do you think they would be inspired to be faithful in their rehearsal and worship service attendance? Again, I doubt it very seriously. Leaders get into trouble when they ask their followers to do things they aren't willing to do themselves. Their followers get annoyed, frustrated, and resentful. Eventually, they will probably stop following that kind of leader altogether. You must lead from the front. All of us are leaders of something. We lead in our families. We may be a leader in the workplace, or a small group at church. All of us would probably be very surprised to know who is watching us for leadership cues. So, what kind of leader are you? Are you the type that that is hiding out at the back of the battle, trying to lead from the rear? Or, are you more like Colonel Shaw, who jumped off of his horse and led his men from the front? The best, most respected leaders always lead from the front lines. Leadership guru John Maxwell puts it this way: "A leader is one who knows the way, goes the way, and shows the way."